with the exercise and infographic below. To find out your dominant energy type, please complete this fun and simple 3-step exercise. Now, why is it so crucial you understand this? It’s simple: because living in alignment with your energy type will help you eliminate blocks, feel tremendous confidence and positive energy, naturally accelerate your body’s rate of healing… and so much more. If you’ve ever wondered why it can be so hard to create financial abundance, great health, peace of mind and healthy relationships, this is the KEY. 1. Choose and write down 4 words from the list below that resonates with you the most. 2. Draw the first shapes that come to your mind. 3. Draw a horizontal line and write “Low Movement” at one end and “High Movement” at the other. Mark a point anywhere on the line that best describes you. Low Movement would represent movements like calm, deliberate hand gestures or a slower paced walk for example. High Movement, on the other hand, would represent a more energetic stride in your walk or have fast-paced speech. 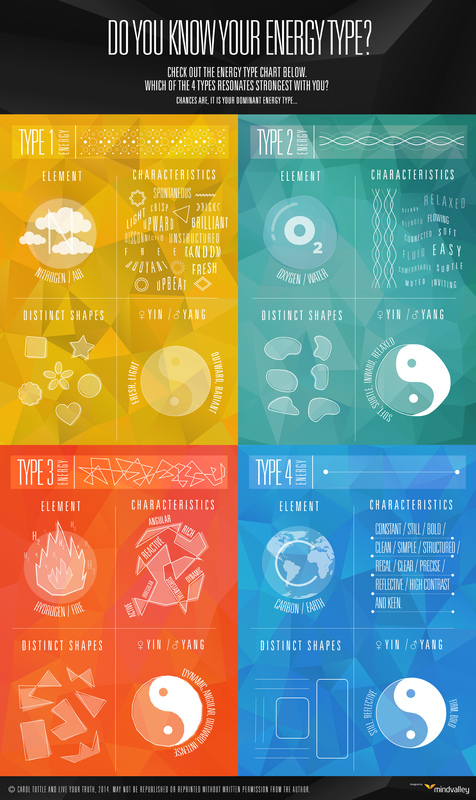 Once you’ve got your answers, check the infographic below to understand your Energy Types. Have Fun! Carol Tuttle, Bestselling author, and master energy therapist, teaching energy healing since 1994 and has helped hundreds of people across the world to improve every aspect of their lives — from money to health, to relationships, to overall emotional well-being. Want to learn how to apply energy healing to your life? Join this Free Masterclass for an eye-opening demonstration where you’ll witness firsthand how energy actually runs our reality and walk away with at least 4 different energy medicine techniques. Energy Medicine – The Secrets of a Master Practitioner – Join NOW!